Finished this a little over a week ago; those of you who follow me on Instagram will have already seen it. It got quite the cool reactions. 95 likes! Think that may be the most any of my photos have got. That's inside on the design wall but at least it's a straight-on shot, and the colour is actually pretty good. I put several possibilities for layout on my blog a month or so ago, and asked for opinions, yet I just wasn't feeling any of them in my heart, you know? 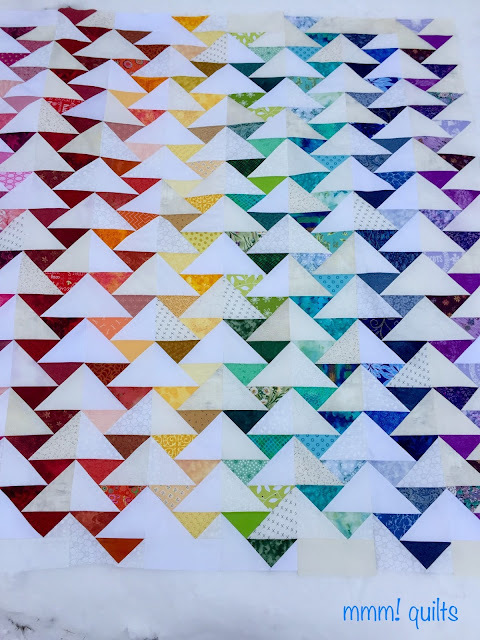 I even came up with a fifth possibility and then just before falling asleep one night, I thought, what if I off-set the rows like I did my Whirling Stars RSC2016 quilt? When I left for Florida last weekend, we had no snow. Well, we set a record for most snowfall on Dec. 13, 15 cm/6". So you know I'd want to set my pristinely pressed, southern-bound geese on that pristine snow! The tutorial I used to make them is here. However, this is Deb Tucker's design, so here is the link to her cutting guide for various sizes, as well as a video, and below is her YouTube video on making them! This is on my Q4 FAL list so I have what, 15 days to get this quilted. 'k bye, as my sweet Brady would say. This is stunning, Sandra! I *love* the layout and although uncomfortable to wrestle with a decision, I'm so glad you let this one percolate for a while. The snow sets it off beautifully, too. 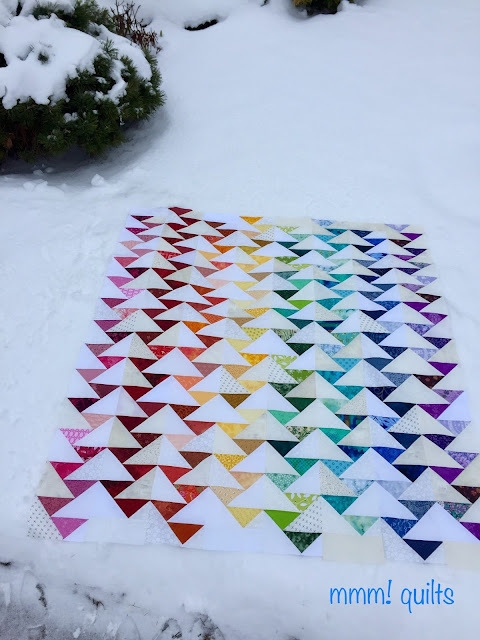 I've used these offset geese in a border but never thought of filling a whole quilt. And "stunning" is the only word for your layout. It's amazing how such a simple tweak makes such a huge difference, and also amazing to think your setting might be brand new. That makes your creativity amazing too. Thanks so much for sharing. Thanks for the you tube link. What a great idea. Oh, Sandra... yes! You waited until you found it. It was worth the wait! When I opened to it, my eyes traveled back and forth across it for a long time. It's all about the white triangles now! They are the star of the show; they tell the story now! They just happen to have a fabulous fabulous colorful background. It's become almost an optical illusion. I had to scroll back to find the first four choices just to remember. 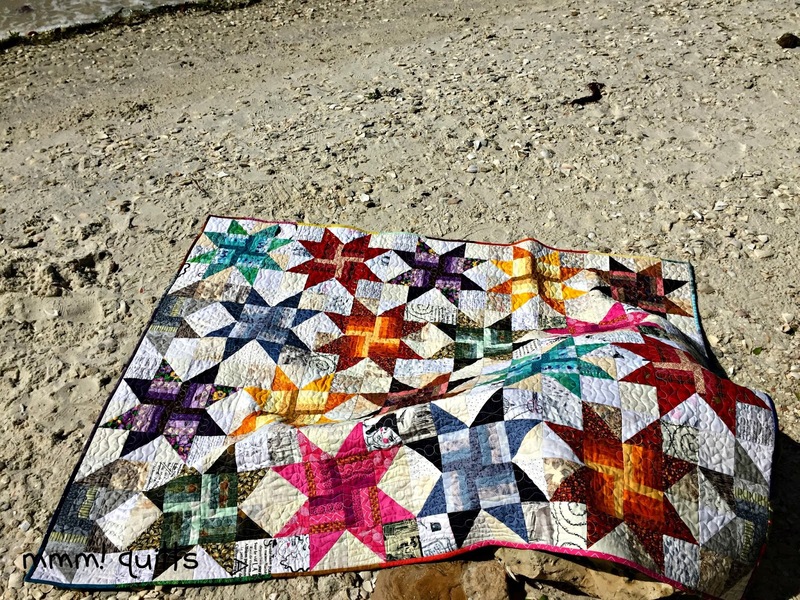 It went from a colorful quilt to a work of art. Can't wait to see it quilted! Love this quilt... the colors and design are amazing! Gorgeous!! Perfect layout - and great snow shots!! So glad you let it percolate as the results are stunning!! 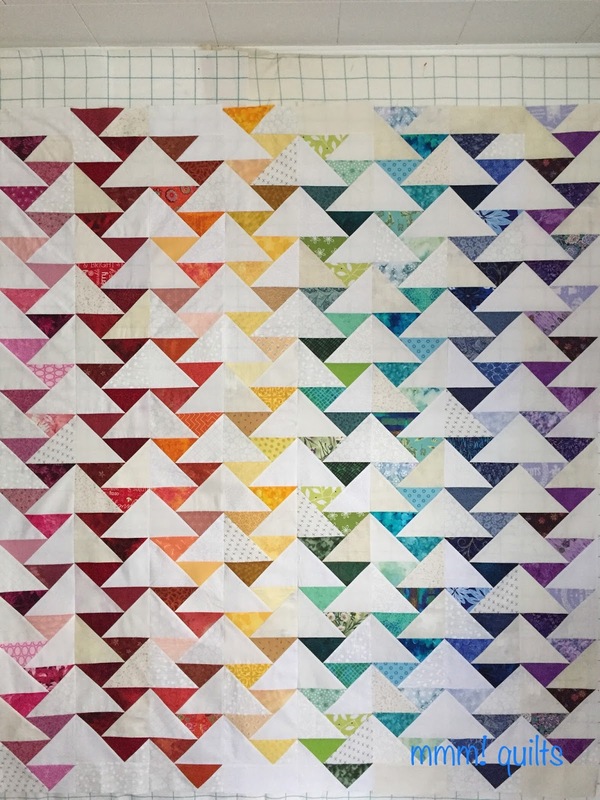 I really love the Migrating Geese blocks, and especially how you laid them out, in color and the design! That's going to be a beautiful quilt! Definitely a block I want to try! Great choice! Those larger white geese make for a great secondary pattern to play with the eyes. Can't wait for you to make even more magic with this one with your FMQing. Merry Christmas! Fantastic arrangement and quilt!! Great use of design and color, also. I absolutely love the arrangement on this with the background forming big geese in the opposite direction. I think this is now on my bucket list. Maybe with bigger geese. Ha! This comment is kind of "off the wall" but I think you should name this quilt Roy G. Biv..your thoughts? Love you geese!! We actually got snow this year in central Texas....maybe 1 1/2 to 2 inches. What fun! Beautiful, just beautiful. You can keep the snow, lol. The layout is amazing, Sandra! All the smaller Rainbow Geese heading one direction, while the big white Snowbirds go the other. I love it! I love this layout and the fun rainbow color palette. I like your geese but I love your stars. Hi Sandra, this is a really fantastic migrating geese quilt. I could look at it for hours! I have shared your link on Clever Chameleon. I love this. This technique is still on my wish list of things to do.